Each morning this week, as I've walked in the dim Daylight Saving Time pre-dawn light up to the Capitol, I've crossed paths with scores of my Architect of the Capitol (AOC) colleagues as they head home after a full night's work. These AOC employees work each night to get the buildings of Congress and the Supreme Court ready for another day – by cleaning, repairing and maintaining them – without interfering with the work of these institutions. As I pass my colleagues on the sidewalk while I walk up the hill, I watch the stars disappear from the sky as the sun's light brightens it. And this week, I've also watched as the lights that illuminate the Capitol Dome at night shut off, leading me to wonder about why they're turning off at that moment, and who's making it happen. Joe Scuderi, project manager and electrical engineer at AOC, researched the history of the lighting of the Capitol and let me know more about the lighting of the Dome and all the lighting around the Capitol. He told me that while we're used to seeing the Capitol Dome illuminated at night, in the past the exterior and even interior of the Dome were lit only during rare night sessions of Congress, for special occasions or holidays. Scuderi explained that today, the exterior of the Dome is lit from dusk to dawn, 365 days a year, even when Congress is not in session. These lights come on automatically, with the timing controlled by an astronomical time clock located in the basement of the Capitol. Also tied to the same clock are the lights that shine on the Apotheosis of Washington inside the Dome and on the grounds around the Capitol. The lighting at the very top of the Dome, in the area called the Tholos, is called a Convene or Session light. Traditionally, it's been lit at night to signal that either the House or the Senate, or both, are in session. 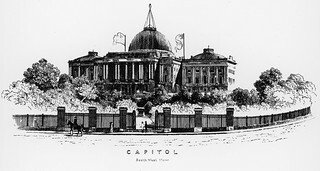 When the Capitol was built, there was no reliable supply of artificial light, so the building includes skylights, cupolas and even interior light wells to provide illumination in the many rooms within. Any original lamps first burned candles or whale oil – this was replaced in the 1830s by kerosene, which wasn't as smelly and sooty. In the 1840s, kerosene was replaced with the latest new form of fuel: natural gas. This culminated in the hanging of a gas lantern that was 6 feet wide and 20 feet tall from a 100-foot tall pine mast atop the old wooden Dome of the Capitol, which started the tradition of placing a light at the highest point of the Capitol. One remarkable feature of the Capitol's original Bulfinch Dome in 1847 was the sight of Crutchett’s Lantern. Rising 92 feet on a mast over the Dome, the 20 feet by 6 feet glass and gilded iron lantern included reflectors that threw light into the Rotunda at night and could be seen miles away. Even after the introduction of electric lights, they weren't consistent enough in quality to replace gas lighting until the late 1800s. The first incandescent lights in the Capitol were installed in 1885, near the Senate Chamber, and they quickly replaced all the gas lights, so that by 1898, almost all of the Capitol was lit by electric lights. In 1905, the Washington Times reported that on the evening before Teddy Roosevelt's inaugural ceremony, "four powerful naval searchlights poured tremendous candlepower upon the Dome," although it was still not regularly lit. For the second inauguration of Woodrow Wilson in 1917, there is a report of the Dome exterior being lit by electric floodlights, but in August of that year, it was decided that the Dome should be lit every night until midnight to "inspire the patriotic sentiment of visitors and troops passing through the city." The practice continued through and after WWI, with advances in technology allowing smaller, more efficient floodlights to be used. The Dome was again blacked out from December 1941 through May 1945 during WWII. In 1990, the lights were again updated; 60 incandescent fixtures were replaced by 38 high-intensity discharge (HID) fixtures. The new lights greatly reduced the maintenance time due to the long life of the new metal halide lamps and they reduced energy usage by 45 percent. I’m impressed by these continual improvements the AOC has made throughout history to illuminate the Capitol both for those who work within it and those who visit and view it from the outside. As Scuderi noted, "there are many other reasons to light the building, going back before even 1929, when it was lit to be visible to small planes, which were becoming more common two years after Lindbergh crossed the Atlantic." For all of those reasons, AOC works to make the Capitol Dome, an enduring symbol of democracy recognized throughout the world, visible to all throughout the night. As I learned, from the clock buried in the basement below the Capitol to the modern light fixtures hidden from view on the roof of the building, there's far more than meets the eye in the lighting of the Capitol.